Last season was another typically unimpressive one for Chris Harris Jr. in terms of statistics. 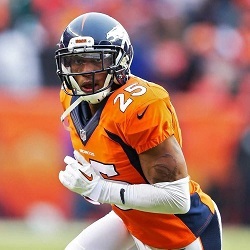 But anyone who is familiar with his work knows that the Denver Broncos’ veteran cornerback is defined by the lack of numbers he puts up. Harris recorded 40 tackles, two interceptions, seven pass breakups and one forced fumble in 2017. Those numbers are what they are in large part because Harris is such an effective cover corner that quarterbacks often don’t throw in his direction. That means he doesn’t have a lot of opportunities to make tackles or get picks. Harris made the most of those opportunities when they were presented to him, though. He only missed two tackles during the season. That coverage ability and sure tackling is what keeps Harris among the best in the league at his position, and why he ranked No. 86 in the most recent edition of the NFL Network’s Top 100 list. Just two years removed from winning a Super Bowl, the Broncos staggered to a 5-11 record last season. But that wasn’t the fault of Harris or the defense. Denver ranked third in the NFL in fewest yards allowed, fourth in fewest passing yards allowed, third in sacks (good coverage from DBs gives pass-rushers more time to get sacks), fourth in pass breakups and second in interceptions. Broncos superstar pass-rusher Von Miller described Harris as the prototypical cornerback, someone who can play inside at the slot position or outside taking on opponent’s No. 1 receiver. With the Broncos losing star cornerback Aqib Talib in the offseason to the L.A. Rams, Harris may be called upon to do more in 2018.